When you login to your system does it really provide a useful snapshot of the data you need to see? What is going right and what is failing and needs attention? 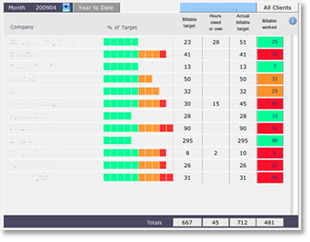 Can you change the dashboard to reflect the dynamics of your organisation or are you stuck with a limited set of parameters? Can Managers drill down to see the actual data? Can users get value from the dashboard without training? One of our clients continually fine-tunes their dashboard - with six significant variations in the last two years - and they are now acknowledged as one of the most efficient organisations in their field.